SALE. Purchase this subject and you get a FREE 30 minute tutorial. This is the standard, single-user version. 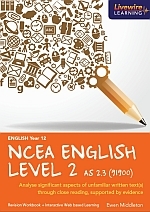 ENGLISH Year 12 content can be sorted either by Topic or by NCEA Level Two Achievement Standards. 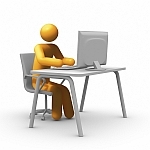 Basic English Skills modules are also included. A copy of the AS2.3 Unfamiliar Text work book is available for only $8.95 + postage. ​This multi-user version may be used by up to 10 students throughout the year. Content can be sorted either by Topic or by NCEA Level Two Achievement Standards. ​​This workbook provides 16 close reading extracts taken from our elearning site but with NCEA style questions. It should be used in conjunction with the eLivewire program. ​NEW. Hour long, one-on-one, online tutorials are now being offered for senior Physics exam students. Free access to e-Livewire included.